So you want to go to the beautiful Florence, Italy. I’m so excited for you!! Last summer, I spent 5 full days there doing solo travel and it was such a wonderful, empowering experience. Alone or not, Florence is a must-see Italian city. Between food and culture, it is full of pleasant surprises, warm breezes, and tasty fragrances. I rented this Airbnb and it was perfect for just me, but it would also be great for 2 travelers as well. The location was great, I walked everywhere I wanted or needed to go, and the Duomo is just a few streets away. Not to mention… It is air conditioned!! If you aren’t able to score this little place, this area in general was great and I felt safe (I was even by myself)! There is a little living area on the bottom part, as well as a newly renovated bathroom, with the bed on the loft above! Don’t mind my exploded suitcase, this was the first room I had to myself in almost two months!! Caffè Rondinelli: Right next to this Airbnb, is a little cafe. It may not look fancy, but it was without a doubt the best cappuccino I had in Florence. The owner (or the guy who worked there every day) was very kind, and the place was never too crowded. A perfect little hidden gem! Fontana Gelateria: Around the corner from the aforementioned cafe, was where I became a daily gelato patron. Two scoops, always. Osteria Santo Spirito: This place is located across the river from the central part of the city and is pretty easy to find. I ate here for lunch twice, the first time I had the truffle gnocchi (to die for) and the second time I had a delicious salad with lots of tomatoes and mozzarella. Foody Farm: A tasty modern restaurant with lots of great options, including and other than Italian food. So if you’re over having pasta pasta pasta, this is your place. Roll the dice: No, this is not the name of a place. This is me telling you that you don’t need a guide to tell you where to eat for every meal. Walk around and stop at a bakery for breakfast. When you get hungry for lunch, see what place near you is poppin’ with people and check out their menu. Florence is so full of amazing food, I challenge you to lift your head up from your phone or guide book and see what calls to you. 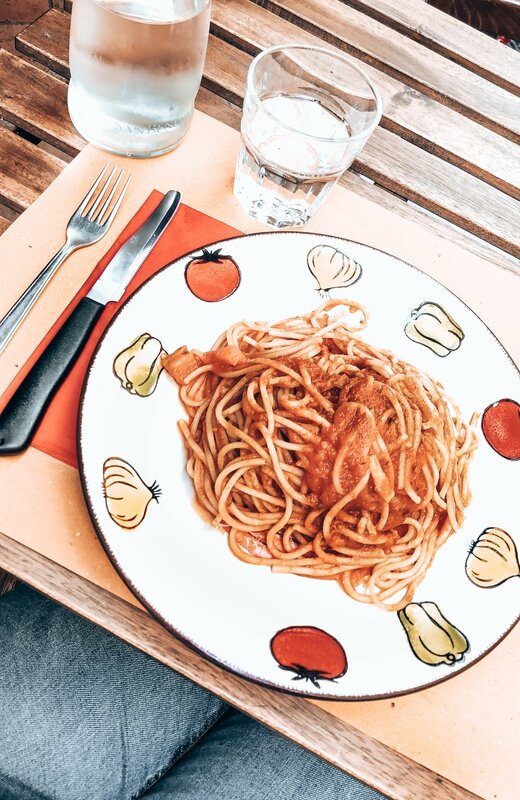 The BEST plate of just regular spaghetti with red sauce I’ve ever had was from a place that I have no clue what the name was, because there was no name anywhere on the restaurant. The random restaurant I stumbled upon that had the tastiest spaghetti and lots of great outdoor seating! Piazzale Michelangelo: The address you can type into Google maps is: 50125 Firenze Fl, Italy. It is a bit of a hike, so I don’t recommend doing it in the dead heat of noon like I did! 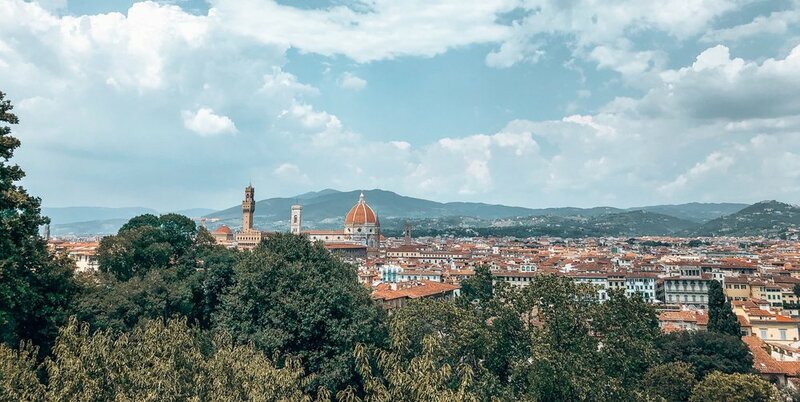 But the view is spectacular and totally a necessity for your trip to Florence. Uffizi Gallery: Home to lots of famous, and not so famous, yet all great, Renaissance and Pre-Renaissance art. You’re in the city where it started, so dive deep and see what the culture was really about. PRO TIP: Get in the line to buy a ticket with a scheduled time to go inside. If you can’t find it, just ask one of the many helpers standing outside the museum, they speak English! Buying your ticket to come back at a specific time will keep you from spending said time waiting in line for general admission! Galeria dell’Accademia: If you’ve never heard of Michelangelo’s David, what marble rock have you been living under? While this museum does have other amazing pieces as well, its biggest attraction is the David statue. The museum opens at 8:15am, but if you want any chance of getting inside within a reasonable amount of time, get there before it opens! I think I got there around 7:30am and I still was in a decent line. Play it safe, make it 7am! It will be worth it to wait in the cool morning air versus the hot sticky afternoon air. Take a class: I took a class about Italian coffee, where we learned about the coffee and learned how to make a real cappuccino by hand and how to make tiramisu! It was a small class, a German couple, an American couple, and me, and our teacher was very knowledgeable and friendly! I found this one AirBnb in their ‘experiences’ section, but they also had a ton of cooking classes, wine tastings, etc. too. Medici Chapel: A chapel created for the powerful Medici family, is quite a sight to see with its stunning interior. Another great sight to see is the small entrance line! For whatever reason this museum/chapel is not high on everyone’s list of priorities, I was in within 10 minutes. Wander Around: I mean just that. You’re in Italy for Pete’s sake. Like they say, when in Rome. The Italians cannot be rushed, especially when it comes to enjoying life. So if there’s anything you must do, it is to simply walk around and do nothing. Take in the sights, smells, and just soak it all in. I can’t tell you how often I ended up just wandering around until I found a restaurant that looked good, a store I wanted to shop in, or a beautiful hidden street to snap a photo of. The three most important pieces of advice I have for you on your trip to Florence is to be flexible, go with the flow, and show up early for your personal “must-see’s”. Soak in every warm, Italian minute. Every early morning stroll when the streets surrounding the Duomo are still asleep. Every hot, silky smooth espresso you drink. And take in the sound of the bustling streets, the quiet, hidden corners, and the sounds of the many church bells as they ring.